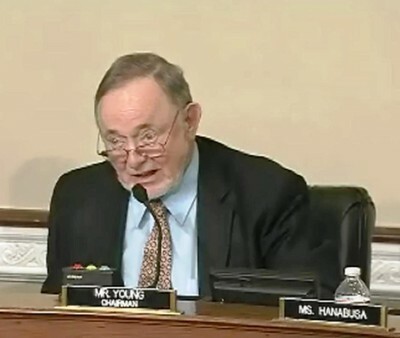 Alaska Congressman Don Young and other Republicans on the House Natural Resources Committee this morning attacked the idea that President Obama might create a marine national monument around the Aleutian Islands, with unknown effects on the fishing industry. But the administration has given no sign it’s considering the notion. Chris Oliver, director of the North Pacific Fisheries Management Council, was an invited witness. He says his council is doing a great job preserving Bering Sea resources, including fish habitat, in part by closing vast areas to fishing. The top Democrat on the Water, Power and Oceans Subcommittee, Jared Huffman of California, says the fist-shaking and the mobilized defense are unnecessary. Huffman then turned to the only Administration witness, Holly Bamford, an acting assistant secretary at the National Oceanic and Atmospheric Administration. Q:To your knowledge, is the Administration considering a national monument designation in the Aleutians? A: I have not been part of those discussions. To my knowledge, no. Q:And I’ve seen no evidence of it either, but it’s one of many (politically) usefull straw men that we see. It’s not clear that a marine monument would be closed to commercial fishing. Bamford says that would depend on the management plan. The president’s power to protect areas of land and water by declaring them National Monuments disturbs the Alaska delegation to Congress. All three lawmakers have proposed bills to curtail that authority. One by Young would ban any marine national monument off Alaska’s shores. At the hearing, Young denied the threat to the Aleutians is a political figment and predicted the administration will declare monument status for the area. Asked about the president’s intentions for the Aleutians, a White House spokeswoman said she has no announcements to make at this time. As for Steiner, he still says Alaska’s federal waters deserve some form of permanent protection, but he got no response from the White House to his petition. He says he did meet with one Administration official this spring who advised him not to expect anything so bold. “But we remain hopeful they may reconsider,” Steiner said by email.